Wherever the process temperature must be shown in situ or in hard-to-reach locations, and where, at the same time, an electrical circuit also needs to be switched, the gas-actuated thermometers with switch contacts are ideally suited. 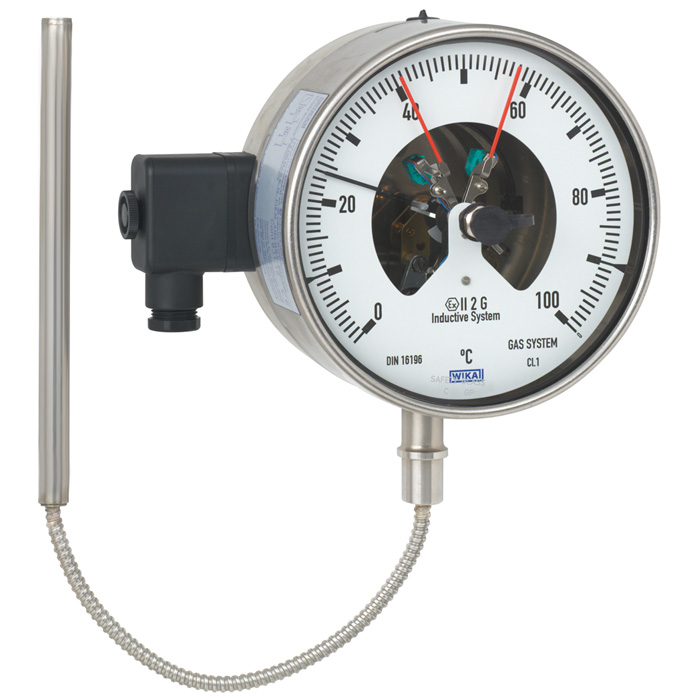 Due to the wide variety of possible designs, the model 73 gas-actuated thermometers can be perfectly adapted to any process connection or location. The adjustable stem and dial version can be adjusted to any angle to allow easy reading. With the contact bulb version (without any contact with the medium), temperature measurements are possible even when the pipe diameter is extremely small. When mounting this thermometer version, it must be ensured that the contact bulb is in contact with the measuring point over its complete length. Switch contacts (electrical alarm contacts) make or break an electric control circuit dependent upon the position of the instrument pointer. The switch contacts are adjustable over the full measuring range. The instrument pointer actual value pointer) moves freely across the entire scale range, independent of the setting. The set pointer can be adjusted via the window using a removable adjustment key (mounted on the terminal box).